A problem some organizations have is that they don’t know where to start. 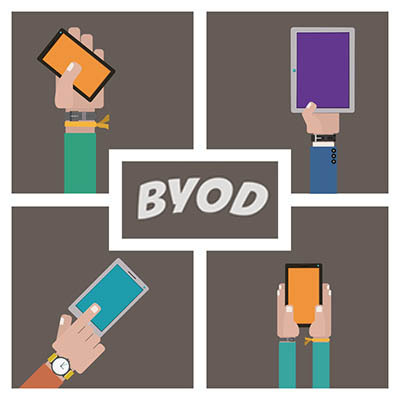 Since IT security policies change from industry to industry, those of a BYOD strategy will too. It all depends on the type of data that is changing hands and the rules and regulations that data may have in the particular industry a business operates in. Is there access to File Sharing? Is there access to Email? Is there access to the VPN? Is there access from the VPN? Is there Remote Desktop access? What network devices/drives can be accessed? What apps and licenses are required? Another big part of a Bring Your Own Device Security Policy is the mobile management software you choose to implement. Without access to that software, any mobile policy your business implements has no teeth. MDM integration may be difficult to get everyone to agree to (as far as BYOD goes) since your typical MDM will provide administrators access to controls that most people would not be comfortable with. Conversely, without them, an organization wouldn’t’ be able to properly manage risk. Nowadays, there are less comprehensive options that can work for everyone where the mobile device management software is replaced by a system that only gives admins visibility into the devices that access their network while implementing security frameworks for every application used by them, with controls to increase and decrease security as needed. By managing access at the application level, users won’t have to opt in to an overreaching mobile security platform run by people they don’t completely trust with the very personal information organizations have no business having access to. You can’t sit back and expect that your organization is going to be safe if you don’t have some sort of strategy in place to manage access to your network. Whether that be a enterprise-level mobile device management platform or a BYOD strategy using simple tools, it’s on you to secure your network against all threats. If you are looking for help securing your organization’s network against any type of outside devices, contact the IT professionals at Washington Works today. Our technicians have the expertise you can depend on to properly manage your data and infrastructure, keeping nefarious and unwanted information off of your network. For more information call us today at 301-571-5040.